Seated (l-r): Peggy Strand, Michael Parrish, Janis Barry, Joan Maynard, Doug Maynard. 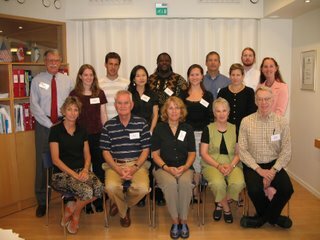 Standing (l-r): Ken Kolson, Katherine Wilson, Philip Tidwell, Daena Funahashi, Charlie Bell, Liesl Yamaguchi, Robert Thompson, Eileen Johnson, Daniel Dye, Karen Keifer-Boyd. Doug Maynard is a sociologist and former NEH Fellow, his project having to do with the delivery of good and bad news by physicians and other healthcare workers. Doug is teaching at the University of Helsinki this semester. The case of Robert Thompson and Charlie Bell is very interesting. Robert teaches English, and Charlie math, at Medina High School in Ohio. Each was unaware of the other’s Fulbright application. The clever folks in Helsinki seized the opportunity to work out an exchange with a Finnish couple who had been living separately because of jobs in school districts distant from one another. Now the Finnish couple are teaching in Medina and living together in the Thompsons’ house in Akron. Warms the cockles of a bureaucrat’s heart.